Kids will want to make this Beaded Cross Shield to hang from their backpack or keychain. 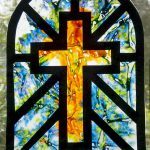 Great project for Vacation Bible School or Sunday School. Trivia: The Knights Templar wore white with a red cross on their shields while the Knights Hospitalier wore black with a white cross. Also the Teutonic Knights who wore white with a black cross. 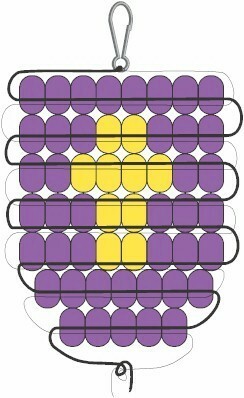 To make the Beaded Cross Shield, click on the pattern for an illustrated view of the instructions. Fold your cord in half to find the center. 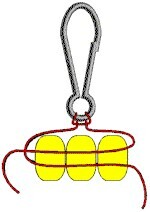 Use a half hitch (see detail in the pattern section) to secure it to lanyard hook. Lace beads using pattern above as a guide. Spread tacky glue along a toothpick and push it through the top row of beads to keep the shape. Cut of ends if they stick out. Is that a specific sized bead to fit? Do you have a place to purchase these beads? These are standard size pony beads and can be purchased at MakingFriends.com or your local craft store. Any chance you have a direct link to purchase pony beads? Those children who have done beading before will probably be able to finish in time, but it will be right on the edge of the time limit. If the others have an aptitude for beading they should be able to finish on their own if you supply them with a copy of the instructions. It is always a good idea to try a craft yourself before introducing it to a class so you can see if it works for you. Thank you. I agree with what you said. If time allows I would like to try it out first. I chose a few crafts from your website. Maybe showing approx time frame for the craft would be helpful.